Equipped with a shock-absorbing mechanism that reduces stress on your joints, the lightweight and easily-adjustable Walker Antishock Light cane is ideal for travel use or for everyday mobility support. The tungsten/carbide tip is sturdy enough for use on unimproved terrain and a removable rubber tip protector allows it to be used indoors or on paved surfaces. 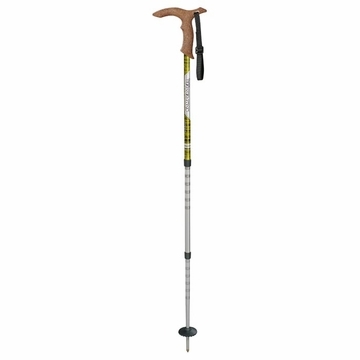 Features a Walker Comfort Cork Grip with standard strap, 3-section walking pole, alloy 7075-T6, anti-shock on/off mechanism, and Vario-trekking basket. Sold as a single pole. Size: 50 cm (21.3") packed, 100 cm (39.4") extended.